To cancel auto-renew for your Formidable subscription license, log in to your Account Subscriptions page and cancel your subscription. When you cancel a susbcription, you could still keep your license for the year but your account won't be billed automatically next year. 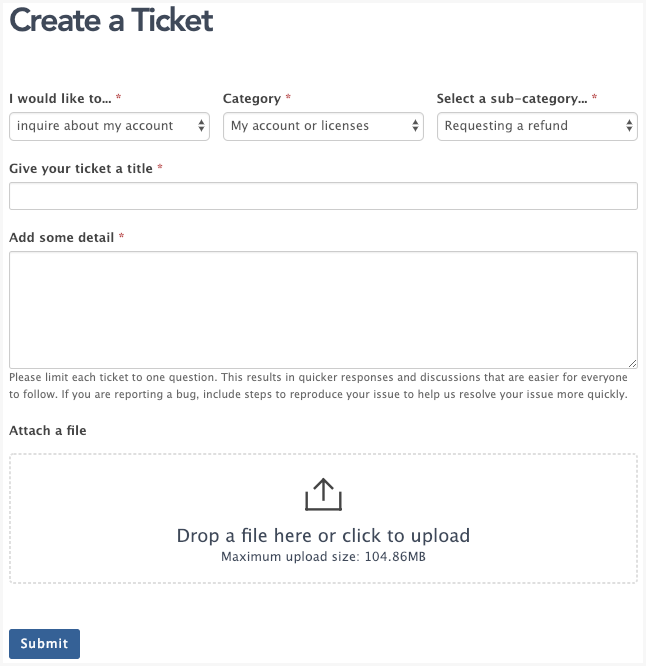 Create a ticket in our helpdesk to submit a request. Set it to Inquire about my account. Choose the My acount or licenses category. Then select the Requesting a refund sub-category. We are always working to make Formidable and our addons better. In the Add some detail field, please describe in detail your reason for requesting a refund and what we could have done differently in order for the plugin to meet your needs. Submit the form and expect to receive a response from our support team within business hours.